The events extend from datagrid, below is the added events for datagrid. onBeforeDragColumn field Fires before drag a column, return false to deny drag. onStartDragColumn field Fires when start dragging a column. onStopDragColumn field Fires when stop dragging a column. onBeforeDropColumn toField, fromField, point Fires before dropping a column, return false to deny drop. toField: The column being targeted for the drop. point: indicate the drop operation, posible values are: 'before' or 'after'. onDropColumn toField, fromField, point Fires when dropping a column. columnMoving none Enable the column moving. 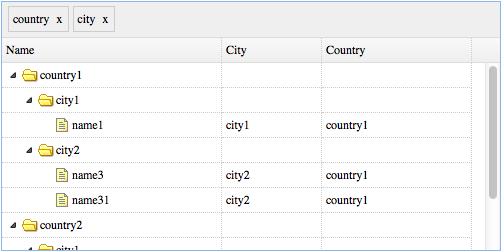 This method allows the user to drag and drop the columns. freezeColumn field Freeze a column. unfreezeColumn field Unfreeze a column. moveColumn param Move a column. reorderColumns fields Reorder the columns. The methods extend from treegrid. groupData param Group data on special columns.